I welcome First Responders and the Military to my shop. I offer a 50% discount off all 60 minute sessions to the families as well. ID is required. 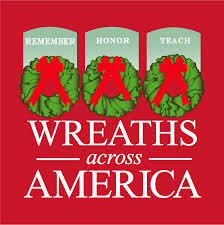 In addition, I will donate $15.00 of a new client 1 hour ($80) session to Wreaths Across America upon request. Wreaths' goal is to place a wreath on every veteran's grave at Christmas. New client price is $80.00. Each wreath cost is $15.00. I have already made a starting donation of 10 wreaths ($150.00) through the Casper Patriot Guard Riders (PGR). Help this donation grow. Please specify in the comments what service you would like - Reflexology or Aroma Therapy or chair massage. Or you make an individual donation of $15 or more directly at the Wreaths Across America site.